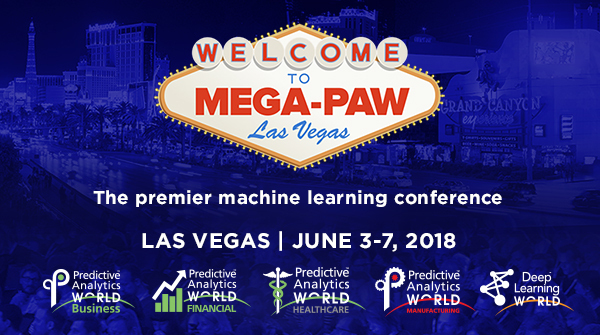 The agenda is live for Predictive Analytics World for Healthcare, Jun 3-7 in Las Vegas, and the conference schedule features five information packed days filled with insightful keynote presentations, interactive workshops, actionable seminars, and great networking opportunities. The agenda is live for Predictive Analytics World for Healthcare Las Vegas — June 3-7, 2018 at Caesars Palace — and we wanted to make sure that you are the first to know. The conference schedule features five information packed days filled with insightful keynote presentations, interactive workshops, actionable seminars, great networking opportunities, and a robust exhibition hall with leading vendors to help you achieve bigger wins and broader capabilities. Keynote: The Greatest Science with John Elder, Elder Research, Inc.
View the agenda and discover how every conference session delivers tomorrow's tactics for today's work. PAW Healthcare is co-located alongside PAW Business, PAW Financial, PAW Manufacturing, and Deep Learning World. Cross registration options are available. The agendas for PAW Business, PAW Financial, and Deep Learning World are also live, view them now.